Once known as the Southern Eyed Brown, this species has been increasing in Massachusetts, while the Eyed Brown may be declining. Appalachian Brown was not described as a separate species until the mid-1900s. Chermock first named it in 1947, and then studies by Cardé, Shapiro and Clench (1970) demonstrated that the two species, while superficially similar, were separated by habitat type, the Eyed Brown being found in open sunny wetlands, and the Appalachian Brown found in surrounding moist woodlands. Early writers such as Thaddeus Harris and Samuel Scudder did not distinguish Eyed and Appalachian Brown; their writings could refer to either species, but seem to refer mainly to Eyed Brown. It is thus especially difficult to sort out what the 19th century distribution of Appalachian Brown may have been, but retroactive determinations of specimens, by curators at the Harvard Museum of Comparative Zoology, Yale Peabody Museum, and others, suggest that Appalachian Brown was common in eastern, but not western Massachusetts. All of the ten specimens in the Harvard MCZ taken by F. H. Sprague in Wollaston (now Quincy, Boston) and Malden in July 1883 have turned out to be Appalachian Browns. (However, Eyed Brown also probably occurred in this area around Boston, because two Sprague Wollaston specimens from 1878 are still identified as such by the MCZ.) Two specimens from Arlington in 1896 (C. Bullard; MCZ) are actually Appalachian Brown, not Northern Pearly-Eye, as originally thought. An 1880 MCZ specimen from "Rock Meadow" in Belmont has been re-determined as Appalachian Brown, and another specimen (c. 1907) from Taunton has also been re-determined to be Appalachian Brown. In eastern Massachusetts Appalachian Brown is widely documented for the late nineteenth and the twentieth centuries, except for Cape Cod and Nantucket. In 1942, Vladimir Nabokov collected two specimens of Appalachian Brown in Wellesley, noting that they were found "deep in forest, with portlandia [Northern Pearly-Eye]" (MCZ). In the 1960’s C. G. Oliver collected Appalachian Brown from West Acton in 1963 and Boxborough in 1965 (Yale Peabody Museum), along with many specimens of Eyed Brown. In 1973 W. D. Winter collected it in West Medway, and in 1979 in Dedham (MCZ specimens). For Martha’s Vineyard, F. M. Jones reported “S. eurydice” from “the bog at Old Millhouse,” but his specimens from 1945 and 1949, in the Yale Peabody Museum, have all been re-determined to be Appalachian Browns. ( Eyed Brown thus does not seem to have been on that island within historical time.) For Nantucket, C. F. Kimball’s report in 1943 does not list either Appalachian or Eyed Brown. Apparently, neither occurred there historically, nor do they today (Jones and Kimball 1943). For Cape Cod there is also a lack of museum specimens and historical reports for either Eyed or Appalachian Brown, and although Appalachian Brown is found on Cape Cod today, it is not common there or in southeastern Massachusetts generally. There appear to be no 19th or early 20th century specimens of Appalachian Brown from western Massachusetts. (But Eyed Brown was documented from the Connecticut River valley in the 19th century: Sprague specimens, Belchertown and Ludlow, MCZ). The earliest Appalachian record for the Connecticut River valley appears to be one from 1976, Amherst ( D. Bowers) in the MCZ which is presently classified as Eyed Brown but which may be Appalachian Brown. According to Lepidopterists' Society reports, Deane Bowers and associates did collect Appalachian Brown in Amherst (LSSS 1976). For Berkshire County, the earliest record appears to be Sheffield, in July 1982 (D. S. Dodge specimen in Yale Peabody Museum). Appalachian Brown may have been slowly expanding its range northward in the 20th century, particularly in central and western Massachusetts, away from the coast. Through the 1960's and 1970's, there are no Appalachian Brown specimens or literature records from Franklin County or Berkshire County, or even Hampshire or Hampden Counties (although there are Eyed Brown specimens); the earliest are those listed above. Subsequently during the MAS 1986-90 Atlas, observers, in "the valley" reported Appalachian Brown from East Longmeadow in 1986 (K. Parker), Sunderland in 1987 (M. Fairbrother) and Holyoke in 1989 (B. King). Atlas observers in the Berkshires reported Appalachian Brown from Sheffield and Ashley Falls in 1989 (E. Dunbar). In addition, there is a 1990 specimen from Sheffield Schenob Brook, P. Z. Goldstein (MCZ). Atlas participants did not find Appalachian Brown in upland central Franklin County; the first report from that area appears to be on the second Central Franklin Xerxes Count, July 17, 1991, when 7 were reported and at least one specimen taken. There are many specimens and literature references, mostly from eastern Massachusetts, which do not adequately distinguish Appalachian Brown from Eyed Brown, and thus have not been used in the above account. For the 1930s through 1950's, these records suggest that Eyed and Appalachian Browns, considered together, were quite well distributed throughout mainland eastern and central Massachusetts, at least, but were rare or uncommon in the southeastern part of the state. Farquhar (1934), for example, adds to Scudder’s account the towns of Lexington, Marblehead, Manchester, Stoneham, and Lincoln, as well as Princeton in Worcester County, for Eyed/Appalachian Brown. There is a lack of specimens of either species from southern Bristol and Plymouth Counties, Cape Cod, and the islands. Appalachian Brown is found in forested wetlands, wet sedge edges of woodlands, and sometimes shrub wetlands; it prefers these areas to open marshes. Red maple swamps with Carex are a prime habitat, but Appalachians can often be found visiting in adjacent areas. 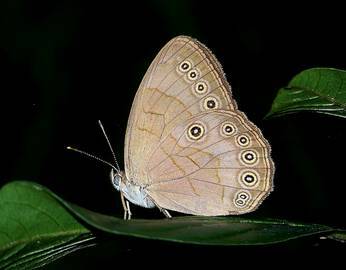 Northern Pearly-Eye (usually in drier forests) and Eyed Brown (usually in the open marsh) are often found flying in the same or nearby areas, and care must be taken in identifying these three similar-looking species. Larvae of Appalachian Brown feed on sedges; in Massachusetts probably mainly the widespread and common tussock-sedge (Carex stricta), but also probably C. bromoides, C. lacustris, C. lupulina, C. trichocarpa, and others (Scott, 1986; Shapiro 1974). All these are native to Massachusetts (Sorrie and Somers 1999). Connecticut Atlas workers observed Carex stricta being used in the wild (O’Donnell et al., 2007). Eggs are laid near, but not directly on the plant; larvae crawl to it. Larvae overwinter as third or fourth instars. Appalachian Brown has not adopted any new non-native hosts as far as is known, but will sometimes accept “grasses” in lab rearings. Appalachian Brown adults feed on sap flows and moist spots in roads; they only occasionally visit flowers. Both total MBC reports 2000-2007, and MAS Atlas bloc reports 1986-90 rank Appalachian Brown as Uncommon in Massachusetts (Table 5). Eyed Brown also ranks as Uncommon, but is usually harder to find than Appalachian. To our north, in Maine and Vermont, Eyed Brown is the more common species, while Appalachian Brown is uncommon, even rare. In Vermont 2002-2007, it was found only in the Champlain and Vermont valleys (VBS). To our south, in Connecticut, the relationship is reversed: Appalachian Brown is more common and widespread, while Eyed Brown is a Species of Special Concern. Massachusetts lies somewhere in the middle. MBC records for both Brown species are undoubtedly affected by the difficulty of separating Appalachian and Eyed Brown in the field. Even with photographs or net-and-release, there are often individuals with intermediate characteristics which are difficult to assign to species. MBC data probably contains some identification errors, but these are partially overcome by the large numbers of reports over this time period. The MAS Atlas faced a similar identification problem, and R. Walton suggested that hybridization might be taking place in Massachusetts. MBC sighting data show a strong upward trend for this species, especially in the years 2006-2009 (Chart 65). Linear regression of these data show R² = 0.463. Calculations by Erik Nielsen in Massachusetts Butterflies show this increase even more dramatically. In 2007, 2008 2009 and 2010, the average number of Appalachian Browns per trip report showed 221% increase in 2007, 288% increase in 2008, 116% increase in 2009, and 61% increase in 2010 relative to the rolling average for preceding years back to 1994. In contrast Eyed Brown showed only modest increases or decreases over these four years. The number of reports of Appalachian Brown, and the maximum number reported, were also up in 2007, 2008, 2009 and 2010 relative to prior years (Nielsen, Season Summary, MB 2008-2010, No. 30, 32, 34, 36). In a third analytic approach, list-length analysis of MBC data by Greg Breed of Harvard Forest also showed Appalachian Brown to be among those southern-based species whose population trajectory was upward (26.1% increase, although not statistically significant) between 1992 and 2010 (Breed et al. 2012). Appalachian Brown was reported from 110 out of 351 towns 1992-2013 (Map 65), while Eyed Brown was reported from only 82 towns. 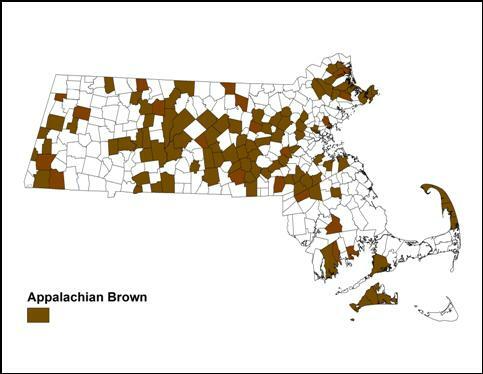 According to BOM-MBC data, Appalachian Brown distribution is statewide, although it is less frequently found in the northern Berkshires, or in southeastern Massachusetts, than in the intermediate areas. The 1986-90 MAS Atlas did not record Appalachian Brown at all from the north-central (Franklin County) and north-western (northern Berkshire County) parts of the state. BOM-MBC records (Map 65) now show this species to be found in both those areas, though it is possibly a recent arrival. While Appalachian Brown may be somewhat uncommon in southeastern Massachusetts relative to other parts of the state, it is nonetheless regularly reported from many locations. In particular, it was found nearly every year on the Bristol County NABA Count, 1990-2011, with a high of 26 reported on 7/19/2003. There are also additional reports from the towns of Dartmouth, Lakeville, Mattapoisett and New Bedford , and an Atlas-era report from the town of Marion along the southern coast. On Cape Cod, Appalachian Brown is more likely to be found than Eyed Brown, which may no longer even be present on the Cape. Appalachian Brown was reported in 1998, 2001, 2008, 2011, 2012 and 2013 from the Outer Cape/Truro NABA Count. BOM-MBC has additional reports from the towns of Eastham, Falmouth, Provincetown, Truro and Wellfleet. Mello and Hansen (2004) suggest several likely locations, including Fort Hill in Eastham. Further west, Appalachian Brown seems to be particularly numerous in the Blackstone Valley NABA Count area, southeast of Worcester, which takes in parts of the towns of Uxbridge, Northbridge, Upton, Mendon, and Sutton. This Count has reported good numbers every year between 2001(count inception) and 2013, with a high count of 38 on 7/14/2007. For Martha’s Vineyard, Appalachian Brown has been reported most years from 1999 (count inception) through 2013 on the NABA Count, with a high of 38 reported 7/11/1999. There are location-specific reports from the towns of Aquinnah, Chilmark, Edgartown, Tisbury and West Tisbury. The Vineyard checklist rates Appalachian Brown as Uncommon on the island (Pelikan 2002). BOM-MBC data thus fill a gap in the 1986-90 MAS Atlas, which did not have any Appalachian Brown reports from Martha’s Vineyard, and also accord with historical specimens from F. M. Jones, which have been determined to be Appalachian, rather than Eyed, Brown (see above). Eyed Brown probably does not occur on the Vineyard. For Nantucket, neither BOM-MBC nor the MAS Atlas show any Appalachian or Eyed Brown records. Neither species was reported there historically, nor is either listed by contemporary observers (LoPresti 2011). At the other end of the state, Berkshire County, the 1986-90 Atlas had found Appalachian Brown only in the southern part. Between 1992 and 2013, this species has continued to be reported in most years in small numbers from the Southern Berkshire NABA count, based mainly in Sheffield, New Marlborough and Great Barrington; for example, 17 were reported on this count 7/13/2012. MBC and NABA Count data now establish that Appalachian Brown is also regularly found in the central Berkshires, as well as in Franklin County, another area where it was unknown through the 1980’s. Appalachian Brown has been reported in small numbers nearly every year 1992 - 2013 on the Central Berkshire NABA Count, with a maximum of 10 on 7/23/2000. There are also reports from Stockbridge, Richmond, and Pittsfield. Good numbers have been reported every year on Central Franklin NABA Count 1993- 2010, with high of 18 on 7/10/1999. The species was first reported on that Count in 1991. There are other separate reports from Orange, Greenfield, and Montague. There are fewer reports of Appalachian Brown from northern Berkshire County. Small numbers have been found in three years on the North Berkshire NABA Counts between 1992 and 2013, and small numbers (which could be misidentified Eyed Browns) have been reported from Heath, New Ashford (Mt. Greylock) and Windsor. These three towns are shown on Map 65. Burlington Mary Cummings Park, 4 on 7/5/2008, E. Nielsen et al; Dartmouth Turner Pond, 4 on 7/26/2009, M. Mello; Easton power line, 10 on 7/31/1993, T. Dodd, B. Cassie, L. Lovell, D. Lang; Falmouth Crane WMA, 7 on 7/16/2000 B. Cassie; Franklin power line, 4 on 8/13/2012, E. LoPresti; Gloucester, 8 on 7/30/1998, D. Savich and C. Tibbits; Great Barrington, 4 on 7/12/2013, B. Benner; Longmeadow Fannie Stebbins WS, 31 on 8/17/2008 T. Gagnon, K. Parker et al. ; Milford power line, 10 on 7/29/2000, B. Bowker; Milton Fowl Meadows, 12 on 7/28/2012, M. Arey; Monson Norcross WS, 4 on 7/19/2006, E. Barry et al. ; Newbury Martin Burns WMA, 10 on 7/7/2013, M. Arey; Newburyport Maudslay SP, 8 on 7/3/2010, B. Zaremba; Northborough/Westborough Crane Swamp Trail, 13 on 7/14/2013, S. Moore and B. Volkle; Northampton Florence Fitzgerald Lake, 5 on 7/4/2013, B. Benner; Sheffield, 7 on 7/15/2012, T. Gagnon; Sherborn gas line, 30 on 7/20/2009, B. Bowker; Sherborn power line, 22 on 6/30/2009, B. Bowker; Stow Assabet River NWR, 4 on 8/24/2008, J. Forbes; Tisbury, 10 on 7/19/1997 A. Keith; Topsfield Ipswich River WS, 13 on 7/6/2008, J. Stichter, D. Savich, C. Tibbits; West Newbury Pikes Bridge Road, 12 on 7/8/2007, E. Nielsen; West Tisbury Hoft Farm, 8 on 7/6/2001, M. Pelikan; Westborough WMA, 9 on 7/1/2007, S. Moore and B. Volkle. According MBC 1993-2008 records, Appalachian Brown flies from mid-June through mid-September, with the most individuals reported in the first and second weeks of July, then another small peak in mid-August (http://www.naba.org/chapters/nabambc/flight-dates-chart.asp). The overall flight period of Eyed Brown is the same, except that a probable second flight of Appalachian Browns is evident in mid-August, which is not the case with Eyed Browns. Opinions differ as to whether Appalachian Brown has two generations in New England, or simply one one long brood with staggered emergences. Like the Northern Pearly-Eye, but unlike Eyed Brown, Appalachian Brown is only “normally” univoltine in northern climes. It is not an obligate univoltine. In Massachusetts, the number of reports of fresh individuals mid-August through mid-September strongly suggests that Appalachian Brown has either a cluster of late emergences or a partial second brood here. For example on 8/7/2010 Longmeadow Fannie Stebbins WS, and 8/21/2010 Milton Fowl Meadow M Arey observed fresh individuals. In 2014, four intact, fresh Appalachian Browns were photographed at Longmeadow Fannie Stebbins on 8/16 by M. Newton; and singles with light wear were photographed in Norfolk on 8/24 by K. Shaw; Sherborn power line on 8/31 by M. Newton, and Amherst on 9/7/2014. A probable partial second brood has also been reported in Vermont (McFarland and Zahendra 2010). Appalachian Brown is fully double-brooded at the latitude of northern Virginia (H. Pavulaan, 9/10/2010, masslep). Earliest sightings: In the twenty-two years of BOM-MBC records (1992-2013), the five earliest "first sightings" of Appalachian Brown are 5/26/2008 Foxboro Lamson Road, M. Champagne; 6/9/2011 Petersham North Common Meadow, G. Breed; 6/10/2007 Sherborn power line, B. Bowker; 6/11/1999, Harvard Oxbow NWR, S. Bolton, and 6/12/2012 Northborough Crane Swamp Trail, S. Moore. The next three "first sightings" are all on 6/15: 6/15/2013 Norfolk, M. Champagne; 6/15/2010 North Andover Weir Hill, H. Hoople, 6/15/2004 Harvard Oxbow NWR, T. Murray. Thus in 8 of these 22 years the first sighting came on 6/15 or earlier. The MAS Atlas gives an early date of 6/13/1987, East Longmeadow, K. Parker. Latest sightings: Appalachian Brown has been seen in September in nine of the twenty-two years under review. The nine latest "last sightings" are 9/25/2013 Amherst, J. Rose; 9/15/2010 Ipswich Appleton Farms, R. Hopping; 9/13/1997 Sharon, B. Cassie; 9/7/2003 Sudbury community gardens, E. Nielsen; 9/4/2000 Norfolk, B. Cassie; 9/3/1995 Milford, R. Hildreth; 9/2/2012 Northbridge B. Bowker and L. Stilwell; 9/2/1999 Milford, R. Hildreth; and 9/1/2005 Amherst, F. Model (fresh; photo on MBC website). There are no other September sightings reported, whether "last" or not, and each of these nine reports is of a single individual. The 1986-90 MAS Atlas cited a late date of 9/3/1988, Chelmsford, J. Center. It seems that September sightings, presumably a partial second brood, are more frequent than usually thought. Appalachian Brown appears to be increasing in New England, perhaps due to northward movement as climate warms (Table 6). The 1995-99 Connecticut Butterfly Atlas found 101 records during the project, as compared to only 48 pre-project records, suggesting some increase. For Eyed Brown, the ratio was reversed (O’Donnell et al. 2007: 324). During the 2005-2011 Maine Butterfly Survey, new records for Appalachian Brown were found in at least ten townships in southern Maine, whereas there had previously been only one historical record for the state (http://mbs.umf.maine.edu/ ). There is much appropriate habitat in Massachusetts for this species. NatureServe (4/2012) puts its status in Massachusetts as currently S4 or “apparently secure.” It may be expected to increase going forward, in contrast to Eyed Brown, which may decrease.